TC Millwork is one of those companies that constantly strive for improvement. Innovative and forward thinking, the company owners are very candid about always looking to the future for new technology and new product development. Founded in 1993, TC Millwork is a full-service manufacturer of store fixtures, architectural millwork and commercial casework. Brothers and Co-owners/ founders Art and Dennis Kubach manage all aspects of the firm, which offers a full range of services for a diverse group of markets, including retail, casino and healthcare plus commercial casework. A short list of their retail clients includes many well-known companies, such as: Pier 1, Clarks, Whole Foods, David’s Bridal, Cato, Kicks USA, Yankee Candle, Wine & Spirits and Home Essentials. “Our services include design, engineering, manufacturing and installation,” says Art Kubach. TC Millwork’s headquarters is in Bensalem, PA, a Northeast suburb of Philadelphia. The plant encompasses 430,000 square feet and has 85 employees. The company also has an office in Xiamen City, Fujian Province, China, which helps position it to provide competitive, offshore pricing for clients’ metal, wire, and acrylic needs, Kubach says. Among the innovative products offered by TC Millwork are the patented Ven4ma, Thermaflex and SMARTWALL. Thermaflex is made from PVC film, thermally fused to a rigid MDF core and is used to produce trims, signs, shelving, panels, counters, soffits and more. “It is durable and won’t crack, chip or delaminate and is a good choice for curves, rounded corners and 3-D effects” Kubach says of the product. SMARTWALL is a low voltage, highly customizable display system that can be configured and manufactured to a client’s specifications and merchandising needs. Elements include puck or strip lights and floating or thin-line standard shelving. “SMARTWALL is basically a wireless integrated wall system using LED lighting that allows a user to move product anywhere on the wall,” Kubach says. 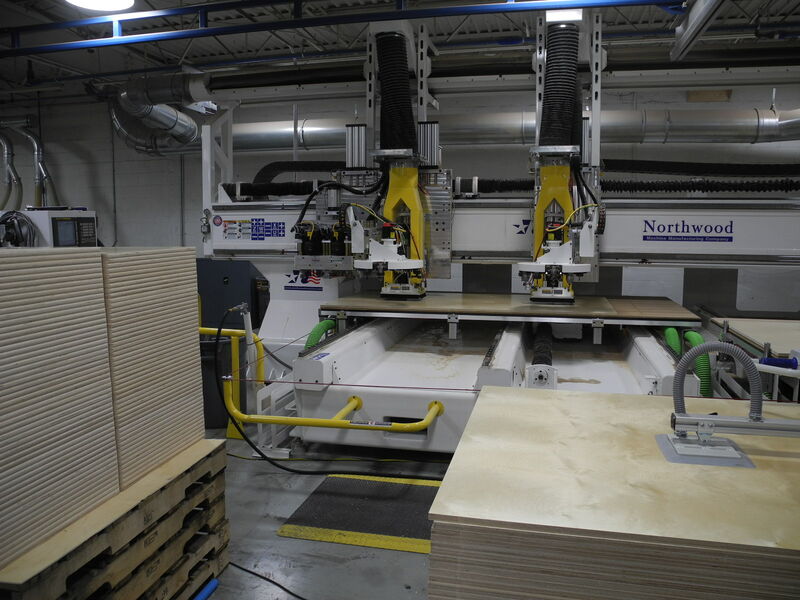 TC Millwork’s facility is equipped with machinery from many different manufacturers including Biesse, C.R. Onsrud, Weeke, Holzma, and Koch. To further enhance its production capabilities, TC Millwork recently added a Brandt airTec 1600 hot air edgebander. Using the airTec unit, co-extruded edges are reactivated with hot air, which achieves a joint-free and zero glue joint. The compressed air “hits” the edgeband at about 500 degrees to activate a glue layer, then rapidly cools to approximately 120 degrees, allowing for quick machining of the panel. “We see this technology as having great potential. It definitely produces a high-end product. Europe has embraced it for cabinetry, and we also saw its potential for retail. It has applications for flat and 3-D products. It not only offers a more visually appealing product without the joint, it offers a more durable product,” Kubach says.